This fictional plot has roots thousands of years old—some just now being literally unearthed. Recently, the discovery of Biblical codices found in Jordan may prove to be a bigger findthan even the Dead Sea Scrolls. Scholars are divided over the authenticity of the texts and the ownership of the tablets is hotly contested. As in TheSecond Messiah , such artifacts may have been found originally by Bedouins, but sometimes are sold or smuggled out of the country leading to dispute ownership. Jordan recently has introduced a law to automatically grant the state rights to newly discovered antiquities. My Take on the BookThis thriller is one that brings in many of the issues that we are dealing in present day society and makes them tangible in a new setting. The author has done an amazing job at intersecting politics and religion. In a way the book reminded me of a Dan Brown novel with a different twist. The author pays very close attention to detail, from the description of the dead sea scrolls to the explanation of the environment surrounding the characters, you feel as if you are drawn into the book and, at least for me, become completely engrossed in the book itself. The book is fast paced and the world that is shared with the readers is one in which spiritual powers are divided to the extent of shattering the overall structure of the religious structure themselves. The characters in the book were great. You had both antagonists and protagonists and the priests that the author shares were priests unlike any that I have ever met - talk about evil! Overall, I enjoyed this book completely and believe that you will as well! ------------------------------------------------------------------------- New to the Divadom or to Dad of Divas Reviews? Please Subscribe to my RSS Feed! 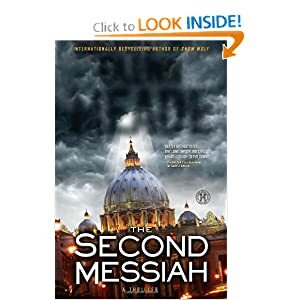 Just a line to say a sincere thank you for your kind review of my book, The Second Messiah.